Choose the AmeriChoice VISA credit card tailored to your needs. Both our VISA Platinum and VISA Platinum Preferred credit cards offer NO gimmicks, low non-variable interest rates, and no annual fees with either card. Are you interested in using your credit card daily to accumulate rewards? Or do you simply need a dependable card to use in emergencies? 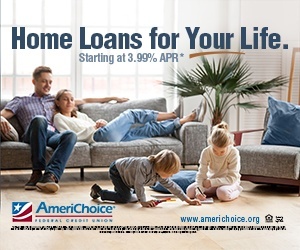 AmeriChoice has credit cards for every financial situation. Compare for yourself and select the VISA card that is right for you. Want to increase the line of credit on your current VISA with AmeriChoice? Scroll down to request a credit line increase. Make online purchases a breeze by setting up your VISA credit and debit cards for VISA Checkout! 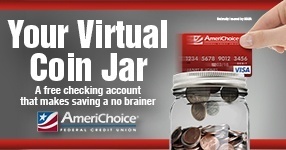 Did you know we offer FREE VISA purchase alerts for AmeriChoice VISA Credit and Debit cards? Click HERE to set your custom alerts. Our most requested credit card, the VISA Platinum offers no annual fee, higher credit limits, and lower non-variable rates. Is your card lost or stolen? Call 1-800-991-4961 today to report the loss or theft. Enjoy a credit card with no annual fee plus flexible ScoreCard Rewards! Perfect for members who use their credit card on a daily basis. Every dollar you charge earns one bonus point. You can redeem bonus points for free gifts and travel benefits. For a sampling of the rewards offered, click here. 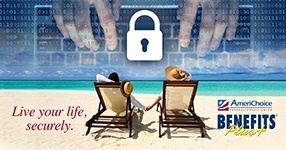 Earn rewards today just by using your AmeriChoice VISA Platinum Preferred Card! Earn Bonus Points for every dollar you spend! Turn your purchases into incredible Gift, Travel or Experience rewards all through the AmeriChoice Score Card Rewards Program. Get started today at www.scorecardrewards.com.